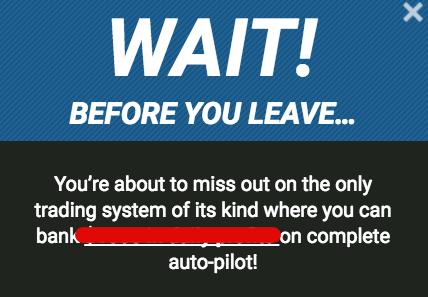 QProfit System Review - Another Dangerous Scam Exposed! Do you want to save your money from scammers who are parading themselves as binary option trading experts? Then this QProfit System Review is for you. Binary options trading is not a new investment method because it has been online for some time now. This system of investment is getting a wide recognition, and this is making scammers create new means of deceiving people. It is true that you can make profits through binary options trading, but you can also incur losses if you don’t understand how the process works. However, using the QProfit Software is not the answer to a safe and profitable binary options trading. QProfit system is a scam designed by a fraud: Jerry Douglas to deceive investors and collect their money. There is no profit to be made through the software, and you should stay away from it. Instead of using QProfit software for binary options trading, put your money where it will not disappear. The designer of QProfit System claims that using the software will guarantee a 95% win ratio. This means that investors can earn up to $2000 every day. Have I also mentioned that you would not spend a dime for the software? Yes! You will get the system free of any charges and get rich without any stress because the system is automated. What a great opportunity you say? Please don’t mind these unscrupulous elements online who has mastered the act of defrauding people of their money in the name of helping them get rich. Sometimes I wonder why they are not richer than many billionaires we know and why no one hears their names. 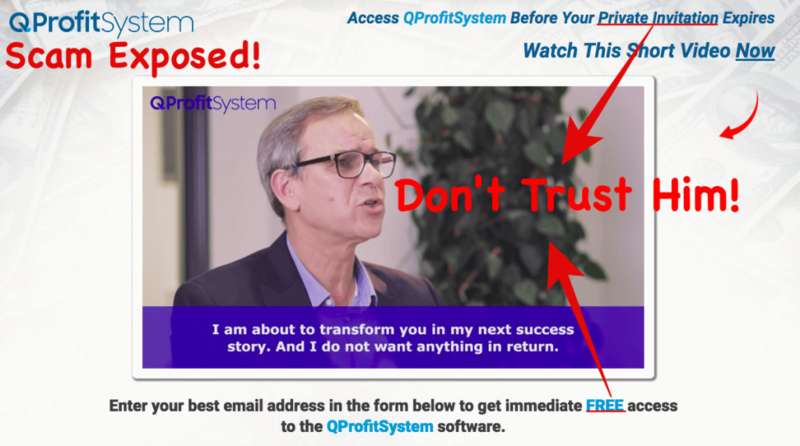 Whenever you see any system like the QProfit Software promising you a get-rich-quick opportunity, don’t bother at all. I have some concrete points that will convince you that Jerry Douglas QProfit System is a scam. 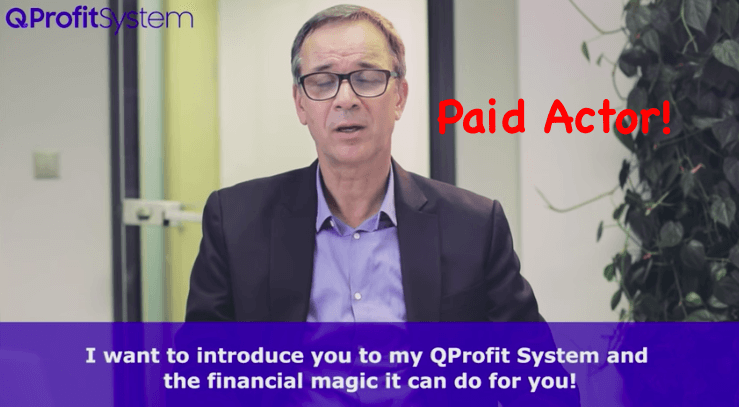 QProfit System Review – Another Scam? Yes! This is the first thing that should ring the alarm bell in your head. Why employ and pay someone to pose as the owner if the automated binary options system works? Jerry Douglas the actor in the video who is claiming to work at Goldman & Sachs is just one of those fictitious characters which scammers create to make their product look legit. Try reading QProfit Risk Disclosure Statement. You will be surprised to learn that even the owners admitted that the video is a work of fiction. Recently, we have also exposed many dangerous scams like The Bitcoin Code & Tesler 2. If you want to judge the authenticity of the QProfit Software for binary options because you saw some fake testimonials on their website, count me out. These testimonials are just created to convince people who don’t understand how binary options trading work. Don’t mind them please; anybody can create fake testimonials to make his product seem like the real thing. The pictures you are seeing are just stock photos. Do you know dangerous it is to deal with brokers who are not regulated nor backed by any company? You will never get the opportunity to withdraw your money. When don’t you have access to your broker’s information to prove how legit he is, how will you withdraw your profit? Also, QProfit Software does not have the backing of any company so there will be no way to get your money back or even sue them to court. This is one of the year’s biggest jokes. 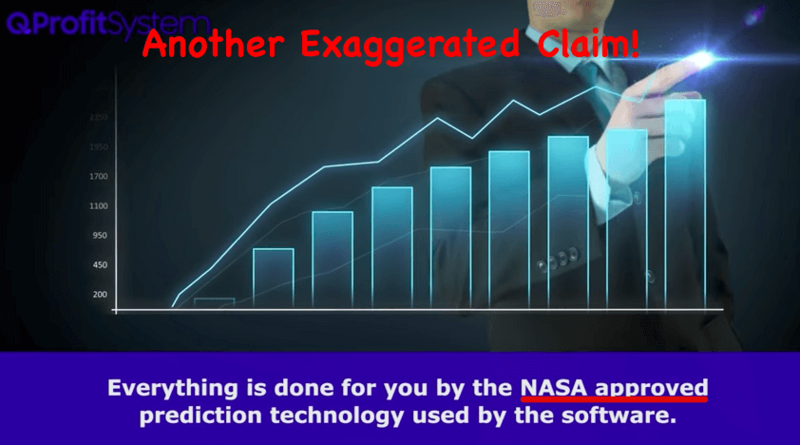 How can a software dealing in binary options trading get approval from NASA? We all know that NASA is an agency for space exploration. 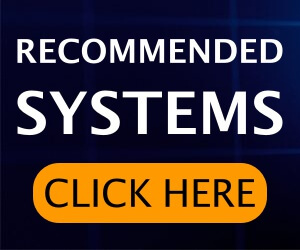 So what is their interest in software that is used for binary options? Yes! The actor claim that the QPoint software is using quantum mechanics to boost the capabilities of the systems’ algorithms which NASA provided to them. No matter how real it sounds, the fake NASA approval doesn’t assure us that investor’s money will not disappear with the system. Stay away from BinBot Pro Scam. The pressure tactic is a method of tricking unsuspecting individuals into a well-set trap by scammers. 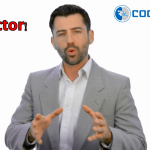 In the binary options trading review, the actor tells users to fill the remaining 50 free slots and start making huge profits. Well, this is just to force your hand so don’t listen to them. If this is true, what about the hundredth person that gets the same offer? Douglas and his team of scammers are trying to convince us that the system App can complete perfect trades every time and as a result, investors can make $2000 profit every day. This claim is too dubious because an automated robot that is 100% risk-free is not real and even the reliable brokers out there will laugh at the possibility. How The QProfit System Scam Works? 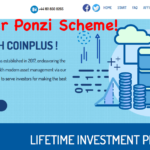 According to the claims of the brains behind this scam, the algorithms in the QProfit trading software use a method of trajectory predicting technique to check the price movement of every trading instrument. This same system they say is like what NASA uses to monitor the movements of the stars. The platform is friendly, and the important controls are very easy to manipulate as well. Since the system is automated, you will only need to login in, monitor and adjust any necessary parameter. This is why new traders are falling into the trap because they don’t need any special skill. The whole truth to QProfit Software is that the people behind it are paid, and you need to deposit your money to those unregulated brokers in order to start trading with QProfit System and that’s where all scam begins. In other words, this automated robot will help you to lose your hard-earned money. 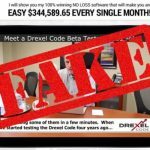 QProfit binary options trading software is a scam, and I have tried to warn you with substantial evidence. The owner is not legit, and Sasha Petroshenko who helped him to design the software is unknown. Binary Options trading can be lucrative, but it is not as easy as they claim. If you want to join other legitimate investors, start with a platform that will allow you to learn through a demo account. Afterwards, you can make real investments and earn real money. Don’t waste your time on QProfit binary options software. Yes! 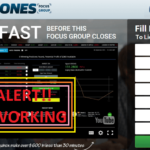 Dow Jones Focus Group is also a Scam? Read to know Why!! What is your take on the broker stoxmarket? Yes. Option Robot is one of the best auto trading robots which you can join. I am from South Africa and I saw the QProfit sytem advert on U Tube. It says in the sales page that he (Jerry Douglas) was asked/instructed by Mark Shuttleworth to develop a system that is absolutely fool proof and would yield 90%-plus returns. The impression is created that Mark wants “revenge” for the $25m tax he had to cough up to the Receiver of Revenue South Africa because he emigrated to the UK. and that this system would only be available in South Africa. Mark will also “sponsor” you with $250 with which you could start of with. There is some more dribble about our corrupt government (cant disagree about that) etc, but this is about the crux of the matter. I think they will dream up similar kind of schemes in different countries where only the characters and cicumstances will suit that country. I wonder how Mark would react to this abuse of his name. No tag to share this on fb? You can use share buttons (located at the end of the article).